Does Rafael Nadal live in clay? He may. Is it where he likes to play? 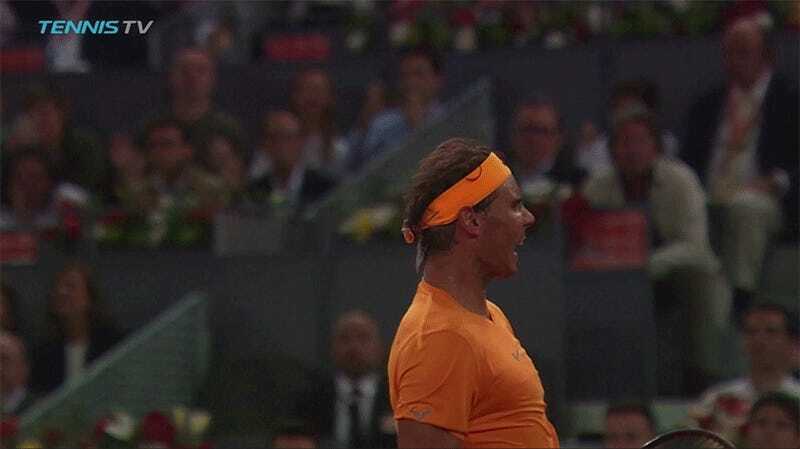 Yea—he has owned it for his entire career, and that dominance was made even clearer two weeks ago when he finally took the record for most consecutive sets won on clay. Today he claimed his 21st straight victim on the red stuff, and with it, another record. After a 6-3, 6-4 win over Diego Schwartzman at the Madrid Open, Nadal snagged a surface-agnostic superlative: No other ATP player has ever won 50 consecutive sets on any one surface. Ornery commentating troll John McEnroe previously held the top slot with his 49 straight sets in 1984 on carpet court, a very fast surface discontinued on the men’s tour in 2009. Rafa tied that mark after the first set of this match, and now his streak of 50, like many of his other accomplishments, seem too baffling and hegemonic to ever be bested. To his credit, the world No. 16 Schwartzman flared up towards the end of the match, offering about as much pushback as anyone on tour could have given Nadal’s current form. Despite standing just 5-foot-7—anomalous among top players in the physical, serve-centric modern game—and despite facing a legend whose signature tactic is to send leaden balls bounding high up off the clay, making them awkward for even a player of average height to attack, Schwartzman exploded off the court to take the ball early, applying just enough pressure to force some uncharacteristic baseline errors from Nadal. Schwartzman’s groundstrokes are immaculate, maybe unsurprisingly, because the margins were always going to be so fine for a player of his stature. Eventually the Argentinian dissolved at 4-4 in the second set, crafting startling rallies only to blow a putaway into open court and a drop shot with Rafa dead behind the baseline, then losing the game on two double-faults. Rafa then served it out and Schwartzman became just another statistic. Over the course of this 50-set win streak, no one has managed to take Nadal to a tiebreaker. Martin Klizan took five games off him on April 27. That was as close as anyone has ever gotten to stealing a set. Tomorrow Nadal gets a rematch with Dominic Thiem, who is the second-best clay-court player at the moment, was the last person to ever beat him on the surface, and was reduced to dust when the two met in Monte Carlo on April 20. It feels like Rafa’s streak will live on.